The onset and progression of dementia can have a significant impact on the health and wellbeing of both a person living with dementia (PwD) and their family caregiver (FCG). Burden of care is a substantial issue affecting relationship quality between caregiver and care recipient and has been found to contribute to higher rates of depression for FCGs and increased challenging behaviours for PwD. In turn this can lead towards a necessity for placement in residential care which is both financially burdensome, and disruptive to the provision of optimal environmental and care conditions for memory preservation and wellbeing. The Australian Government has made it a strategic priority to support PwD/FCG dyads to remain living in the family home for as long as possible. They are investing in activities and research that support relationship quality, assists PwD to remain independent for longer, and sustains FCGs in their caring roles. 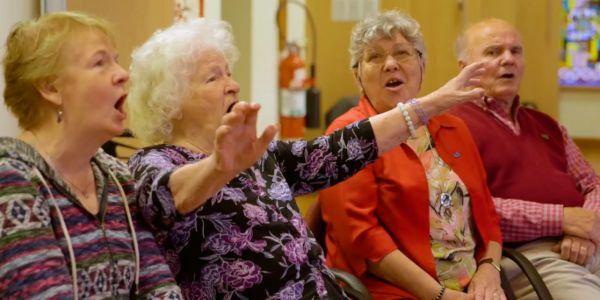 With the benefits of group singing and music participation now becoming better understood and publicised, the National Health and Medical Research Council (NHMRC) and Australian Research Council (ARC) have invested in a study that looks at this very approach for addressing the needs of the country’s ageing population. Remini-Sing is a randomised controlled trial offering PwD and their FCG an opportunity to participate in weekly therapeutic singing groups with other dyads living in similar circumstances. The study follows on from a pilot project which demonstrated that 20 weekly choir sessions contributed to sustained relationship quality and wellbeing outcomes for 11 community-dwelling PwD and their FCGs. Lead researcher, Dr Jeanette Tamplin (UoM) said the most surprising thing about the pilot was the great benefits reported by carers: “The carers all commented on the inclusiveness of the group and the overwhelming sense of support and understanding from the other carers. They also got so much joy from connecting with their loved one through music”. Whilst the primary aim of this randomised controlled trial is to determine whether therapeutic group singing can sustain or improve relationship quality between community-dwelling PwD and FCGs, the study will also examine whether participation in the music groups can improve wellbeing and quality of life for both PwD and FCGs. Results of the pilot project hinted at a number of social, emotional and cognitive benefits from group music participation. The research team hope to explore these benefits further with the ultimate aim of developing evidence-based, dementia-specific, therapeutic music participation opportunities for people living in the community. The University of Melbourne is seeking research participants aged 60 years or older, who have been diagnosed with dementia and are still living at home together with a family member or carer. Once recruited, participants (in their dyads) will be randomly assigned to either a Remini-Sing group, or a waitlisted control group who can join a Remini-Sing group after the study if they wish.